There are few people who have had more compliments on the website than Alec Cogswell. For many years he was the dynamic force in the village running the scouts, involved in Box Rovers Football Club and Box Cricket Club and simply helping anyone who needed it. He even did a term on the Parish Council, although it wasn’t really to his taste. Everyone agreed, he was one of the nicest people you could wish to meet. This is the story of his life around the time of the Second World War as recalled by his daughter, Sue, and son, Graham. Box stone mason and, like him, dad was devoted to the village throughout his life. It was a notable event when the scouts lost one of their members to war duty. Scoutmaster Phil Lambert had already joined up and left Box by the end of 1939. It was just the start. 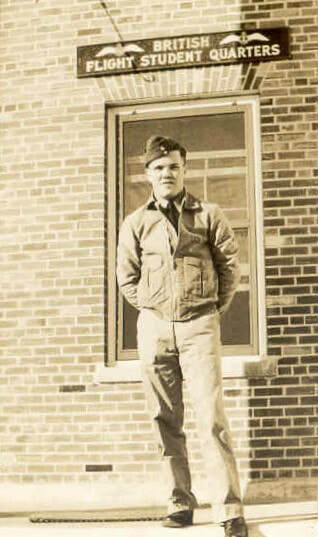 An evacuee child, Bill Cooper, remembers when Alec left to join up. Bill was an eight year-old cub who lined up at the old Scout Hut after the Remembrance Day Parade in 1940 to shake hands and say farewell to Alec and also Doug Screen, who were going to join up. Dad was 20 when he enlisted and accepted an enrolment on the British Commonwealth Air Training programme. He travelled to Moncton, New Brunswick, Canada, across the Atlantic, in the freezing winter of 1940. He was stationed at RCAF (Royal Canadian Air Force) Lakeburn, Number 8 Service Flying Training school, close to Moncton. The station comprised several wooden buildings including a 40 bed hospital, 5 double size hangars, barracks, mess hall and recreation facilities. Training was mostly on De Havilland Mosquito planes. Local Canadian communities embraced the young overseas trainee airmen and, on arriving close to Christmas, dad was invited to a local family, the Johnsons, for a festive dinner. He kept in close contact with them and, growing up, every Christmas there would be a card and greetings from “ Mom and Pop Johnson". Below: Alec's hosts at Moncton, New Brunswick, for the 20 year-old recruit were the family who came to be called "Mom and Pop Johnson". Dad then travelled to Pensacola, Florida, USA, to complete his training, piloting Catalina Flying planes. This was with the US Naval Air service under a scheme known as The Towers Scheme. He finally went into action with 201 squadron in Gibraltar, a strategic port for the allies. 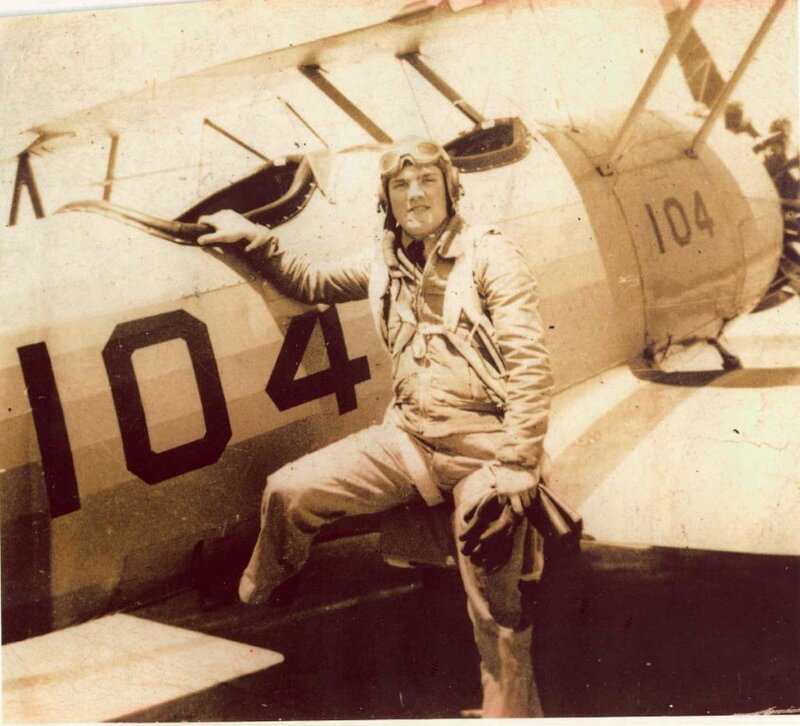 He rose through the ranks to second pilot and flight sergeant. He then moved to Killadeas, Northern Ireland, to become a warrant officer commanding a Catalina with a crew of nine. After the defeat of Italy and Germany in the Mediterranean, he was sent to Banff, Scotland, for conversion to coastal command in Squadron 235. He learned to fly Beauforts and Beaufighters but above all he loved the De Haviland Mosquitos. These wooden fighters had a speed of 400 mph and were a joy to fly. Dad and his crew made anti submarine patrols between Scotland and Norway. He completed his wartime service with Coastal command, patrolling the Atlantic between Northern Ireland and Bergen, Norway. Each mission being potentially life threatening, close bonds were formed quickly among the crew. The bond was never forgotten as all crew members kept in contact for many years. At the end of the war he moved some 15 different types of aircraft around the UK to suit logistical requirement. His log books make fascinating reading. 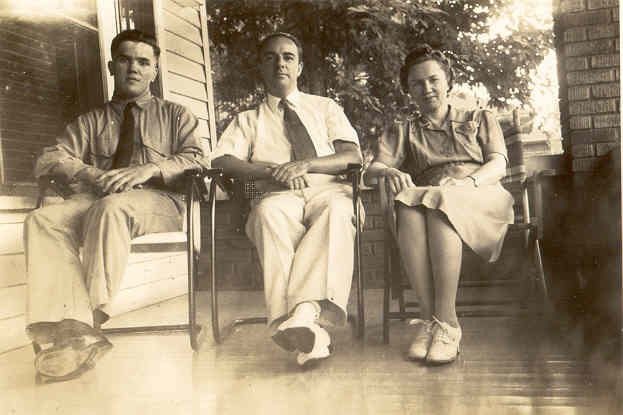 Dad was demobbed in 1946 and went back to his pre-war job with the Post Office and to his parent’s home at Box. He was awarded four medals for his war efforts. These were torrid times and like many who returned it was not until later life that he really talked about his experiences. When asked about the medals, as the modest man that he was, he would say that one was for joining up, one when he left and one given out by the Belgium government. The later was actually Croix de Guerre 1940 with Palme in recognition of services rendered in connection with the liberation of Belgium. His log books, scrap books and maps of the day make fascinating reading of the excitement and perils that they encountered on each and every mission. as a result of dad’s remonstrations, the Council decided to regularise the position. 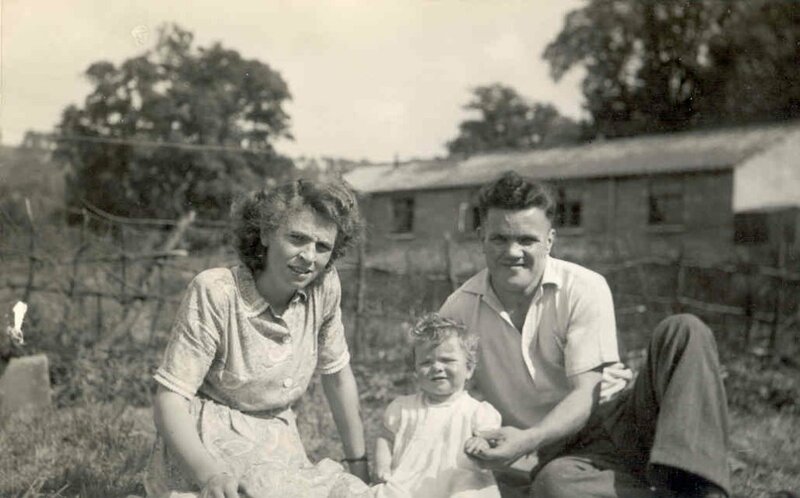 Below is a photo of mum and dad living at The Barracks, Ashley, which is shown in the background. Dad was born and grew up at number 4, High Street Box. Sadly, his mum Florence and stone mason dad Albert sadly died. So mum and dad moved into the family home, before moving to a council House in Hazelbury Hill. They had their mind set on owning Villa Rosa in London Road and, when the opportunity arose in 1960, they scraped together enough to buy it. It was hard financially in the early days and dad's sister moved into two rooms to help share the costs. Dad also took up a second job as the part time groundsman of the Recreation ground in Box until 1973. A transfer and promotion in the Civil Service followed. Perhaps the biggest influence in dad's boyhood was the Boy Scouts (as it was called then). He joined the first Box Troop when he was 11 in 1931. There was a long waiting list in those days. He took his scout promise, became a First-Class Scout and was made patrol leader of the Peewit patrol. He left the Scouts on 9 Jan 1938 along with seven others and formed the first Box Rover Scouts, all with high ideals which Baden Powell had crammed into Rovering to Success. During the first half of 1939 when not ranging far and wide over the countryside, they hotly debated such subjects as Should the Scout law be ignored in war time? and Was Japan justified in invading China? They knew the clouds of war were gathering! After the war dad re-established the idea of scouting in post war Box by resurrecting 1st Box Scout Troup as Scout Master in April 1949. Dad was always keen on the Scout movement and was already a leader in a 1955 photograph of the Cub Pack. The period after the war was one of rationing and lack of finance for leisure pursuits like scouting but Alec had plans to build a new Scout Hall on the Devizes Road with little financial help. He organised the scouts to set about doing the work themselves. Sue remembers her brother Graham and her taking thermoses of tea up to him when he was laying reclaimed building blocks from the army barracks at Ashley. Perhaps his experience of living there gave him the idea to buy them for £12 when the barracks were demolished in September 1953. The scouts raised the money from two annual jumble sales and two Bob-a-Job weeks but that was the easy bit. The old Ashley buildings had to be dismantled by the scouts and transported to the Devizes Road. 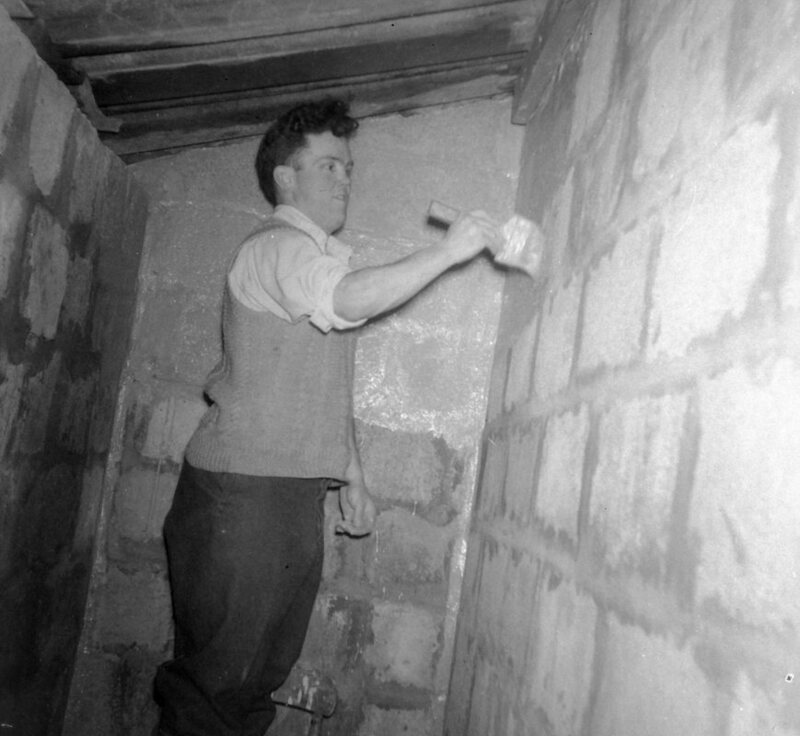 One of the main tasks was chipping mortar from hundreds of old hollow concrete blocks that came from the dismantled huts. With a diminishing numbers of scouts, never exceeding six men and six boys, Alec planned everything although he had no experience of laying blocks or of designing a building. Within nine months, they built a main hall measuring 38 feet by 20 feet, with separate entrance hall, office and cloakrooms together with loft storage areas for camping and other equipment. There was adult help from Norman Martin who did the electrical work, G Browning who transported many of the blocks and Phil Lambert and the Hadsphaltic Construction Company of Chippenham. Most of all, it was the hard work of the scouts which built the new hut. Special mention was made of one boy, 14 years-old Bobby Hancock, who worked with the scoutmaster by artificial light all winter, evenings and weekends. The Headquarters were opened in May 1956 by the Wiltshire County Commissioner with a grand ceremony. The newspaper reported that the opening set the seal on a remarkable story of real endeavour by Scout master Alec Cogswell, backed up by about half a dozen scouts and the same number of parents. Scout numbers grew and so did their ambitions. Alec was the inspiration and leader of a number scout camps ably supported by cub master, Len Weeks. They didn't always work to plan. 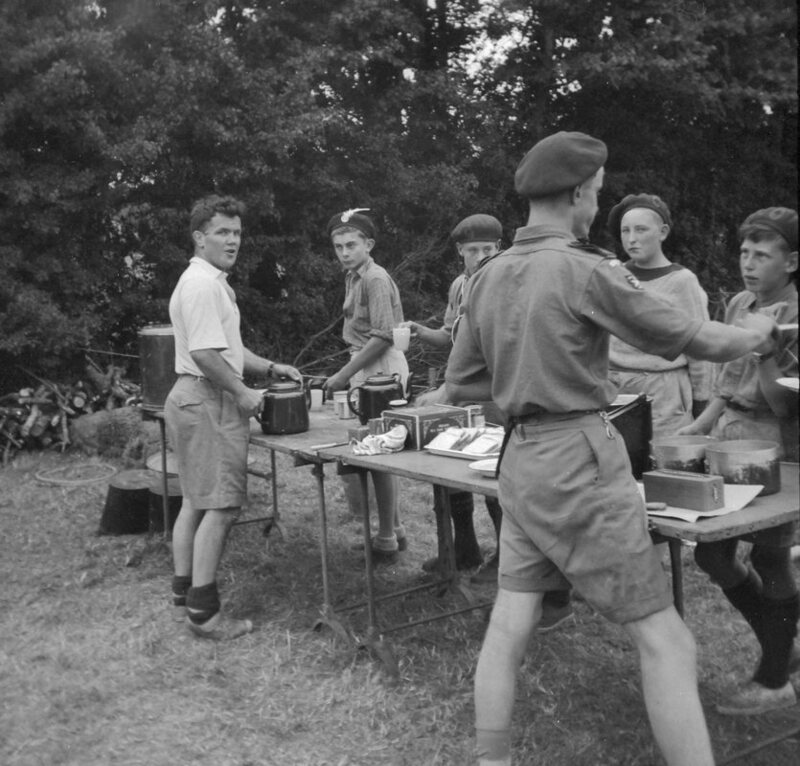 The visit to Guernsey in 1959 delivered the scouts safely to the island but all the tents were left at the quayside in Weymouth and wouldn't be delivered until the following day. The Guernsey scouts troop took pity and organised accommodation in the loft of an old house where they slept on hundreds of mattresses left over from war. The Scouts returned the following year with all the kit this time and again in 1966, during the World Cup Football finals. Despite determined efforts the scouts couldn’t find a TV to watch the game on and had to content themselves listening to the final on the radio! From left to right: Clifford Lovell; ? Clutterbuck; Roger Banks; Ian Cogswell (front -small) Bernard Little; ? Clutterbuck; Dave Hill; Duncan Cogswell (front-small); unknown (hidden at back); ? Munday; Graham Cogswell. Another initiative was the building of a timber and canvas canoe from kits, named Le Becquet, after the farm on Guernsey where the troop had two summer camps in 1959 and 1960. The three-man canoe was launched behind the mill at Box to a great ceremony and was involved in many adventures: creating a taste for canoeing, a later stage involved the making of a two-man fibre glass canoe, Tony Fry and Peter Baldwin from the troop entered the great Devizes to Westminster canoe race, amd an endurance race mainly along the canals to London over a bank holiday weekend in May, a major achievement for the pair and from such a small troop. Funding for tents and equipment was always hard to come by so dad organised monthly whist drives, in the new hall. They were very popular and well liked. After one evening there was a huge downpour, so dad offered a shuttle, free taxi service to a number of older people who had walked. On the fifth trip he aquaplaned on the torrent flowing down the main A4 and ended up smashing his car through the very large glass window in the front of the Co-op! There are many more stories of scouting adventures. He finally gave up scouting in the early 1970s after more than 40 years' involvement. He was awarded the Medal of Merit for services to Scouting. Dad attended Box primary school under Mr Druett and passed his exams and moved on to Chippenham Grammar School. There started one of the dominating influences in his life, a love of sport. He played for the school first teams at cricket, hockey and above all football. After the war he busied himself on a number of sporting fronts. One was the formation of Box Rovers Football club, the story of which will appear elsewhere on the website. Mum and dad's closest friends were the Lovells. Hilda and Bernard squatted with them at Ashley and Bernard and dad played football together for Box Rovers for many years and continued their involvement for many years after they retired. They won the Wilts Junior Cup in the same year and took seven coaches of supporters to the final at Melksham. Dad also had a passion for cricket. At the birth of Graham, he chose to play cricket rather than attend the birth, which didn’t go down well. When he phoned up in the evening he was given a right earful by the matron! For a long time Alec was involved with the maintenance of the Recreation Ground as a groundsman needed to keep the Cricket Club pitch and outfield suitable for playing the sport. But it was his playing that won him most respect. He had a unique style and a most unusual bat. It had been repaired over the years with nails, screws, glue and layer upon layer of tape. It was very heavy and needed a certain knack to use it! The Gunn and Moore bat was the oldest still in use in Box, last used in 2009. An extract from Don Bradfield’s A Century of Village Cricket records his cricketing contribution: Even the leanest of periods produce players who could on occasions lift the standard of play above the mediocre or who could thrill the spectators with some big hitting. Such a person was Alec Cogswell, who found time to add the club’s treasurership to his multifarious parish interest. No match was ever lost until Alec was on his way back to the pavilion, for he could turn what looked like certain defeat into victory in less time than it took a man to drink a pint of ale on the lawn of the Queens. Armed with a heavily bound old bat, given him many years ago by the mother of the very reverend FL Hughes, the war time Chaplain general to the forces to King George VI, Alec would lay about him with cheerful abandon. Many people speak of their wartime experiences as a defining time but not dad. He loved his time in Box after the war where he blossomed as a person and found the comradeship that he needed. He received as much pleasure as he gave to others. His father was a pillar of the community and this ethos was passed on to dad. He put in enormous time and effort into community organisations, in a quiet, calm and productive way. He was a real stalwart of Box. He died in 2004.